With the current discount at Stargek (still valid until end of the month!) the price is very reasonable to allow for an unplanned RC purchase Additionally you can get 5% on your next day's purchase if you use Nets (i.e. you buy the kit today, you go back tomorrow and buy paint, which is virtually free due to the 5% you get on your kit purchase). I treated this as a budget build by purchasing no hop-ups, only what I could find in stock at home. That included paint. The kit requires a large number of bearings: 20 x 1150 and 4 x 850. That can add up to quite an expense. Two of the 850 bearings are supposed to be unusual flanged bearings. I used ordinary ones and it appears to be fine. The car also needs oil shocks. The pogo-sticks in the kit are just unbearable, especially in the back with the weight of the motor all the way at the rear end. I had some spare clear CVA from our M05pro that I refurbished. The battery compartment is very generous and fits most LiPos. 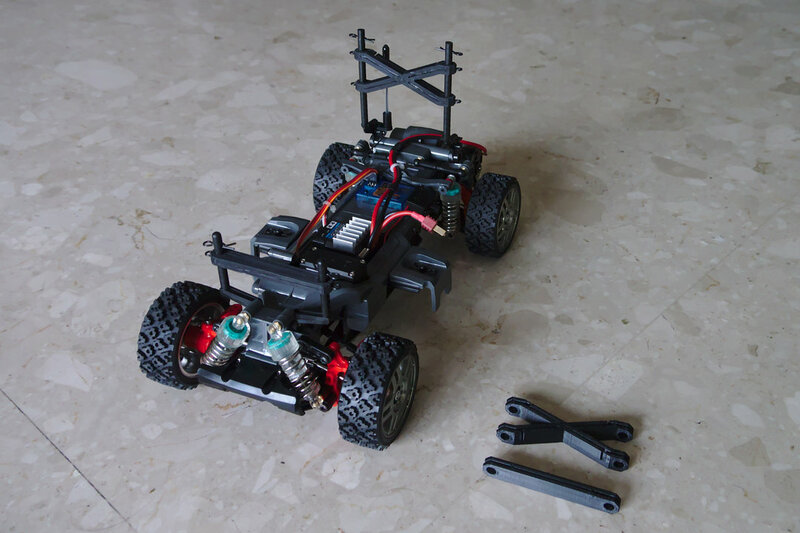 The only trouble is the battery wire management as the M-chassis body with 160 mm width is very narrow. This chassis is designed for 10th scale tires, not M-chassis tires. This means that bodies from older M-chassis cars will not fit, or will look odd. The gearing of the chassis is adjusted to the large tires, so running M-chassis tires will make it very slow and spoil the fun. Something to be aware of. The good news is that the motor mount is sliding, so any pinion between 16T and 20T can be used. The suspension on both MF-01X and M05ra use exactly the same parts (except for the color), so the ride height difference is only caused by the larger tires. Note that the M05ra has 210 mm wheel base, the MF-01X Jimny 225. The MF-01X can be built with 210 as well, but requires purchasing a shorter shaft. 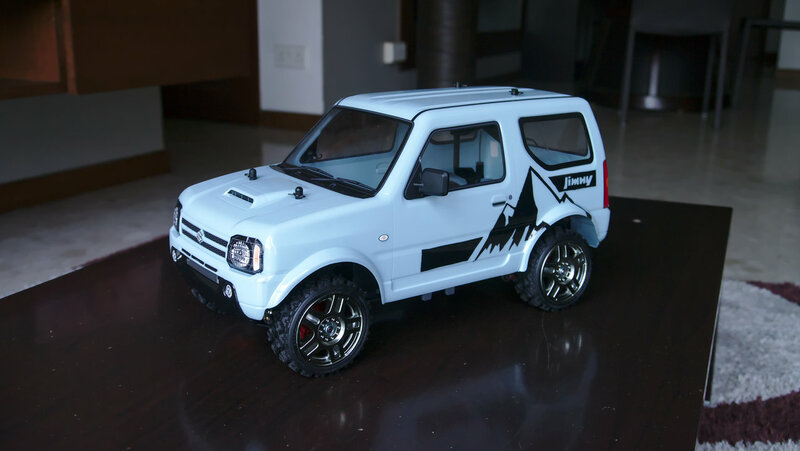 I am not a particular fan of the Jimny body, lets hope Tamiya brings out more pleasant looking shells for this chassis. The body is very flimsy especially in the rear, as the Lexan had to be stretched a lot during the vacuum forming process. This will not last long. Because the body posts are so tall front and rear, the shell wobbles horribly. 3Racing has a body stiffener for sale; we printed our own (and two copies for the other Jimny owners). All-in-all, a very welcome addition to the M-chassis range. It is a great kit. Go get yourself one! Looking forward to run this car! Lovely! Another Jimny ready to roll! Jimny is coming on strong...... Good write up. Thanks for sharing. So we got some batteries running through this little car yesterday in Woodgrove. It is so much fun! Easy to drive, good traction. It has a bit of lift-off oversteer, which allows you to correct easily should you enter a corner too fast. Being short and narrow, it does not like large bumps of course. When it flips, it often uprights itself. The front drive train needs upgrading to CVDs. Both cars that were running yesterday had front dog bones pop out multiple times, which gets annoying quickly. They don't fly off the chassis, but they pop out the front upright and jam the steering. On ours we are running a beefier motor (Team Powers brushed), but on the small, sandy surface in Woodgrove that made no difference as the car was not able to bring the additional speed to the ground. The other car with the stock motor was as quick as ours (plus had a better driver ). Stick with the kit motor if you plan to run on loose surfaces. The body held up reasonably well, but both shells cracked in the front, It is advisable to protect the front, rear and sides with cloth tape. The sides and rear can rub on the chassis, which will rub off paint after some time. Both cars were running oil shocks. 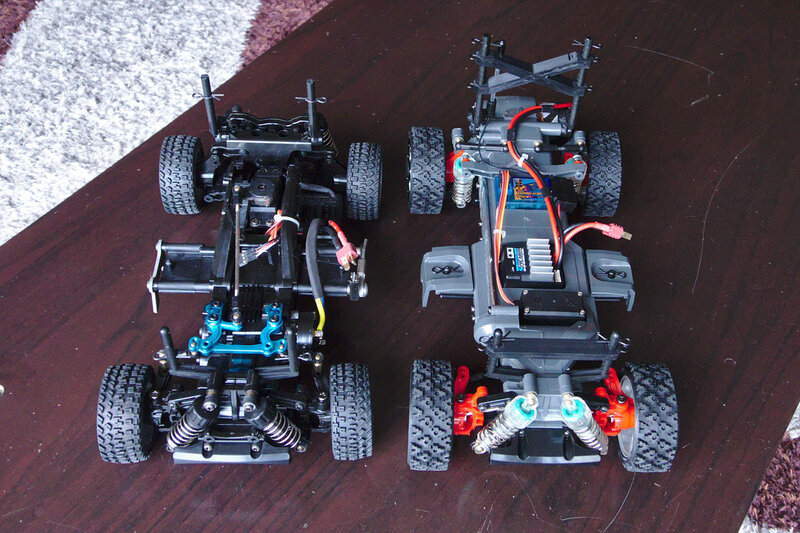 Ours has the short clear M-chassis plastic shocks, the other one had the Mini CVA plastic shocks (note: Mini CVA, not the smaller Super Mini!). The Mini CVA shocks gave the car less suspension travel than ours, but that didn't seem to make any difference while driving. One car yesterday had the front diff locked and the rear open, ours has the front diff semi-locked with lots of anti-wear grease and the rear slightly only a little bit of anti-wear. Definitely recommended over open diffs on loose surfaces for more grip through the corners. This little car is really a blast to drive; go and get one! So...... Can we say that, the MF01X is a upgrading version of M05Ra chassis? And MF01X chassis has a better off-road cabability than the M05Ra? It uses the 1/10 scale rally wheels with 66mm diameter, while the M05ra uses 55 or 60mm wheels. That alone makes a huge difference in ground clearance and therefore off-road capability. If you live in Singapore you will find that neither will work well on grass. Our grass here is just too large and tough. The M05ra is really more for very flat, smooth dirt surfaces. The MF-01X can deal with more bumpy stuff, but is also a handful to handle because of its high center of gravity and short/narrow wheelbase. Lots of fun to drive and low cost. An issue with the MF-01X currently is the lack of suitable bodies. You are basically stuck with the Jimny. Sure, it is 225mm / 160mm wide, just like the other M-chassis, but the gearing is designed for the larger tires so none of the normal M-chassis bodies fit (unless you butcher the wheel arches). 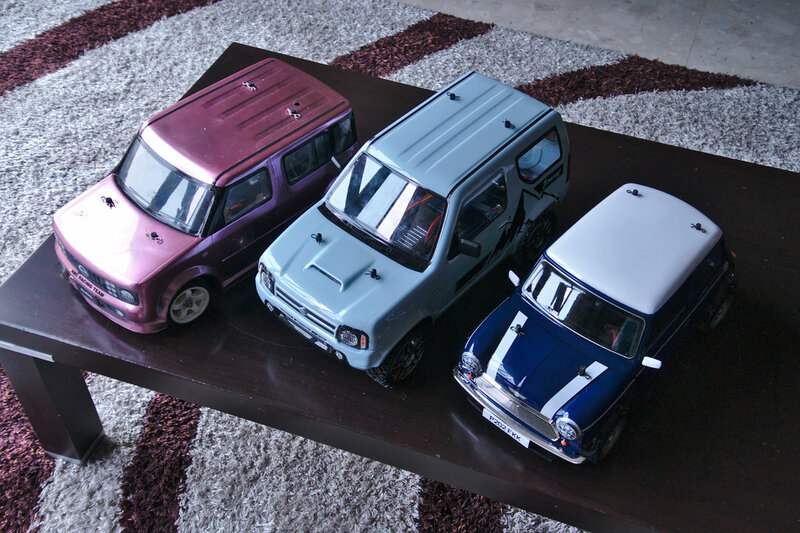 In the Tamiya range you should also have a look at the CC01. Something like the Landfreeder or the VW Amarok. Those have more ground clearance, but are still decently quick out of the box. 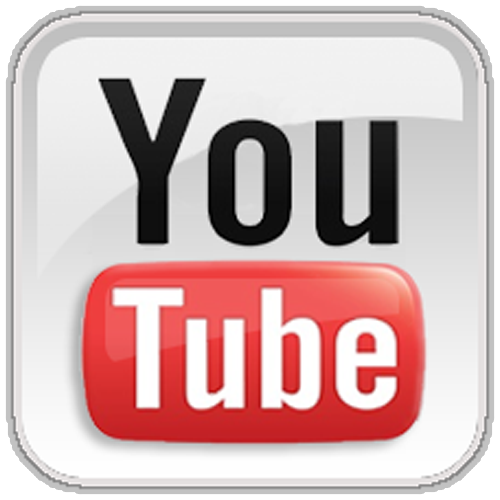 The CC01 is a quite old design and therefore more expensive than the modern stuff. Those cars mentioned so far are more "rally type", i.e. speedy driving over a mildly bumpy surface. 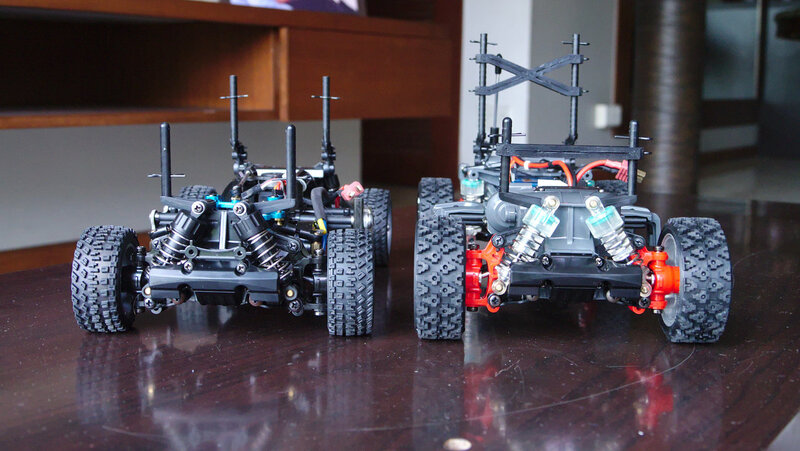 If you are looking for more hard-core off-roading, mudding and crawling consider investing in an Axial SCX10, G-Made Sawback/Komodo, RC4WD. Those are "slow", but in a totally different league when it comes to handling rough terrain. Thank you very much about the explaination, my friend!